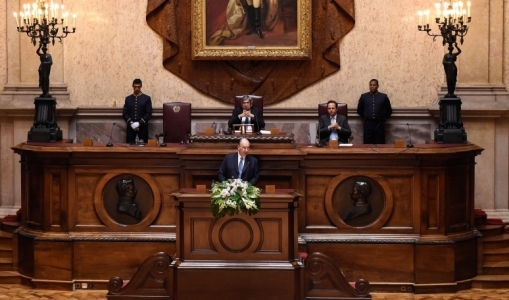 Address by His Highness the Aga Khan to the Parliament of Portugal 2018-07-10 | Ismaili.NET - Heritage F.I.E.L.D. It is always a personal pleasure for me to return to Portugal. I treasure wonderful memories of earlier visits here - including the gracious hospitality of the last five Presidents of the Parliament. Portugal is surely an ideal place for me to conclude my Diamond Jubilee anniversary - celebrating my sixtieth year as Imam of the Shia Ismaili Muslims. During this Jubilee year, I have visited Ismaili communities in many parts of the world. And now the anniversary events come to a happy culmination here in Portugal, so graciously facilitated by the strong collaboration of the Portuguese diplomatic service abroad, and the civil service here in Lisbon. I am told that some 40 thousand members of the Ismaili community have come here this week to share in our Jubilee celebrations. In the process, of course, they will also have the opportunity to discover Portugal, many of them for the first time. In doing so they are joining a great wave of foreign visitors who have made Portugal one of the fastest growing travel destinations in the world. Of course, when we use the word “discover” in connection with Portugal, we are immediately reminded of the leading role that Portugal played in the great Age of Discovery - a half a millennium and more, ago. The spirit of discovery - of reaching out, of connecting and engaging, has long been a central part of Portuguese culture. It was here, on the Iberian peninsula, between the 8th and the 16th centuries, that the History of Al-Andalus was written - when Muslim administrations worked constructively with people of the Christian and the Jewish faiths, viewing a diversity of talents and energies as a source of strength – rather than a cause for division. This pluralistic outlook has been reflected at many points throughout Portuguese history – and it has been powerfully expressed in the recent re-emergence of this country as an influential leader on the global stage. I think of the strong roles played by Portuguese leaders at the United Nations, and UNESCO, at the European Commission, and - as of just last week - at the International Organization for Migration, to mention only a few examples. As I have traveled throughout the world in recent years, one of the most hopeful developments I have identified is the emergence of countries with the potential to become “Countries of Opportunity.” And certainly Portugal has been earning a high place on that list. To become a Country of Opportunity is not an easy matter, it is something that the people and the government of a nation must work at, creatively, patiently, and persistently. A Country of Opportunity is one that builds on the strengths of its past, while also addressing its problems, embracing enduring values while respecting a variety of viewpoints. Countries of Opportunity value legal structures that create a climate of predictability and confidence, an enabling environment for creative change. A Country of Opportunity is one that encourages cooperation among diverse interests, fostering partnerships between government and the private sector, for example, while also encouraging those private organisations that are designed to serve public goals, what we often call the institutions of civil society. It is because of such factors that we can think today of Portugal as a Country of Opportunity, a Country that seeks to honour both its past achievements and its future opportunities, to embrace both the gift of social stability and the promise of social progress. And the Portuguese Parliament is to be commended for its role in that encouraging story. My viewpoint on this matter is widely shared. One example, is the Global Peace Index for 2018, a report for the Institute for Economics and Peace. The Global Peace Index measures some 23 economic, social and political factors which contribute to peaceful societies in 162 countries. And it came as no surprise to see that, among all the nations in the world, Portugal is ranked in the top five. It was with these values in mind that we signed an historic agreement in Lisbon in 2015 - an Agreement to establish here a new Seat of the Ismaili Imamat. This means that Lisbon, already a leading international crossroads city, will also now serve as a central connecting point for the global Ismaili community. After that Agreement was signed three years ago, it was approved by the Portuguese Parliament, and I am pleased to thank the Parliament today, in person, for that welcoming endorsement. Of course, we can trace the story of Ismaili engagement with Portugal back many years - even to the time when Ismailis settled in Portuguese Territories in India in the 17th Century, or when later Ismaili settlers came to Mozambique. Another milestone moment was the generous welcome that Portugal offered almost half a century ago to many Ismailis fleeing the Mozambiquan civil war. Since that time, Ismaili ties to Portugal have multiplied. The Aga Khan Foundation in Portugal was established in the mid-1980's. In 1998 we created a new Ismaili Centre in Lisbon. Protocols of Cooperation between the Imamat and Portugal were signed in 2005, in 2008, in 2009, and in 2016, as well as a Memorandum of Understanding between the Aga Khan University and the Catholic University of Portugal. The word momentum comes to mind! What we celebrate today is an advancing sense of momentum - a spirit of progressive partnership between the Portuguese nation and the Ismaili Imamat. Today, the Ismailis are a highly diversified community, living in more than 25 countries, mostly in the developing world, but with increasing numbers in Europe and North America. The Ismaili Imamat itself, as you may know, is an international institution that goes back some 15 centuries, to the time of Prophet Muhammad (may peace be upon Him and his Family). This means that when I inherited my role just 61 years ago, I became the 49th hereditary Imam of the Ismaili Muslims. Through the centuries, the Seat of the Ismaili Imamat has been formally designated in one or more locations by the Imam-of-the-Time, depending on the requirements of the day. It has known many homes over the years - throughout the Arabian Peninsula, in the Middle East, in South Asia, and in North Africa. It moved to Cairo in the tenth century, when my ancestors founded that city. The decision to establish a new Seat here in Portugal, at the gracious invitation of your Government, is one that has been taken after much reflection and consultation. It represents a true milestone moment in the long history of the Imamat. The authority of the Ismaili Imam is spiritual rather than temporal in nature. At the same time, Islam believes fundamentally that the spiritual and material worlds are inextricably connected. This means that the Imam-of-the-Time also has a responsibility for improving the quality of life - the quality of worldly life - for his people, and for the people among whom the Ismailis live. It is to advance those responsibilities that so much of my attention over these sixty years has been committed not only to strengthening the Imamat’s capacities to fulfill its mandate, but also to the work of what we now call the AKDN - the Aga Khan Development Network. The AKDN includes a variety of agencies working in the fields of economic development, education, health care, and cultural enrichment. Our fundamental objective is to do whatever we can to help to improve the quality of human life. And that is the spirit that will continue to inspire our partnership with the people and the Government of Portugal. We know that the days ahead will be demanding ones, a time of profound global change. Economic developments are bringing new prospects for influence in the Global East, and a new sense of hope in the Global South. One new study suggests that two-thirds of the world’s growth in the next few years will be centered in the cities of the developing world. At the same time, new technologies of communication and transportation are inter-connecting the world more closely than ever before. What will these new realities mean for all of us? On the one hand, we must recognise, realistically, that our inter-connected world could bring about an increasing sense of suspicion, fear, and perhaps even vertigo as we look into the future. Diverse peoples, sadly, can sometimes interpret their differences as threats rather than as opportunities, defining their own identity by those they are against, rather than what they are for. On the other hand, closer interactions in our world will also produce wonderful new opportunities for creative cooperation, for healthy inter-dependence, for new discovery and inspiring growth. When that happens, the opportunity to engage with people who are different from us need not be seen as a burden, but rather, as a blessing. The welcoming attitude is often described as a pluralistic outlook. It was the animating concept behind one of our major AKDN projects, our establishment, together with the Government of Canada, of the Global Centre for Pluralism in Ottawa. Since its founding 12 years ago, the Centre has worked to advance what we all refer to as a Cosmopolitan Ethic. Fostering strong Cosmopolitan Ethic in our world is surely a central challenge of our time. As we face that challenge, Portugal is a most encouraging example. A Cosmopolitan Ethic has contributed abundantly to Portuguese culture in the past, and I know it will continue to animate this country’s future. It is a value that we will deeply enrich with our continuing partnership, as we establish here in Lisbon, a city with a true global vision, a new Seat of the Imamat, a committed global institution. The Ismaili Imamat will now be proudly moving some of its activities into the magnificent, historic Palacete Mendonça. There we will establish our Department of Diplomatic Affairs and our Department of Jamati Institutions. We are already planning to host, here in Lisbon, next year’s meeting of the Board of the Global Centre for Pluralism, as well as the inaugural Aga Khan Award for Music. And there will be much more to follow. And so, our planning moves forward. We know that we face a demanding future. But as we engage with those demands, the Ismaili Imamat will draw strength from our continuing sense of partnership with the people and the Government of Portugal. So let us, then, go forward together, bound by our shared past, committed to our shared values, and inspired by our shared hopes for a constructive, purposeful future.